Dipped in chocolate, topped on a shortcake, mixed in a smoothie or enjoyed alone, you probably have a favorite way to eat strawberries! Strawberries are the sweetest and juiciest from January through March, so now’s the time to add them to your shopping list. Our Produce department works directly with strawberry growers to guarantee our customers the very best quality. When you stop by our Produce department to pick out sweet strawberries, you will find ripe, delicious and brilliantly red choices. Many of our strawberries are grown right in the south, which means we’re able to have them quickly delivered to all our stores. Not only are these berries sweet and delicious, they are also packed with vitamin C. Did you know that eight medium-sized strawberries have only 50 calories? To find even more nutritional facts, visit our At Season’s Peak page. Choose strawberries that are plump and smooth. Select strawberries that are bright in color with fresh green caps. 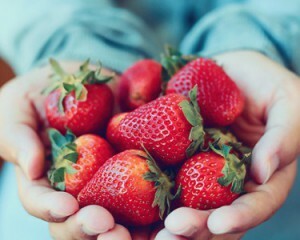 Eat strawberries soon after purchase and refrigerate for up to three days. 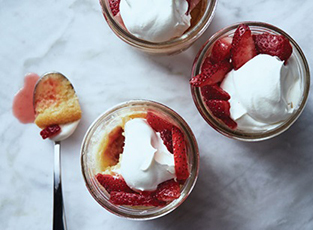 For the very best flavor, bring strawberries to room temperature before enjoying. You can’t go wrong with anything strawberry and of course eating them fresh from the farm is delicious too. Tell us your favorite way to enjoy them!